Who do I contact to get a valuation for my current property? How do I go about selling my house? Our commitment is to give you a professional and personal service with personal regular updates during the selling and buying process. Communication is a paramount importance to us. 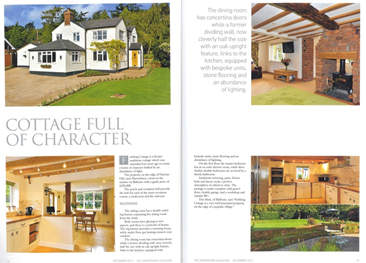 We know how best to bring a property to the market, how to present it and how to find the right purchaser. 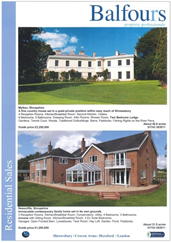 With full colour brochures including floor plans, professional photographs and plans where needed. Your property will be presented in the very best way. Our sales team have expert knowledge and experience within Shropshire, that’s why we are here for you to help advise and give you the best experience possible. We are only as good as our people. That’s why our sales team love what they do. They have fantastic knowledge of the area and will make the selling and buying of your property the best experience we can. On 26th January, a new property portal will be launched by Agents Mutual and will be called www.onthemarket.co.uk. On the market will be owned and run by Estate Agents and has already got 4000 estate agency branches signed up including most of the large national firms. The CEO of Agents Mutual Ian Springett successfully started Prime Location which was initially owned by the agents and was then sold to Zoopla. Agents Mutual currently has an initial marketing budget of £8m for onthemarket. The one stipulation for estate agents is that they may only go on one other website as well as onthemarket to try and break up the duopoly of right move and zoopla. Right move is the largest and most used property portal in terms of traffic volume and is the 8th most used website in the whole of the UK, below Google, Facebook and Amazon etc. 80% of our online enquires come from Right move and we believe onthemarket will compliment right move very well. Zoopla is the 25th and Primelocation is down at 120th. We believe many other firms will follow the 4000 branches already signed up to OTM and continue with right move while cancelling their agreements with ZPG. We will also be on our own Balfours website which is about to be re launched and The London Office (logos). We use the latest technology to market your home combined with traditional services and values. A brochure of the property will be immediately forwarded to all those applicants who are registered with Balfours looking for similar properties. Advertising will be in an agreed selection of local papers and magazines. All our advertisements will appear in colour. 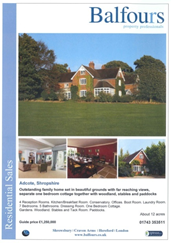 Details of the property will be held in our Shrewsbury, Craven Arms and Hereford offices. In addition, details of your property will be sent to the London office in St James’ Place where they will hold hard copies of the brochure. Balfours are part of a collaboration of 37 independent agents throughout the country. We discuss ideas with them as there is no direct competition. We have a Move to the Country exhibition once a year in London which is organised by The London Office and marketed by London Agents Douglas and Gordon. We will issue press releases when the property is launched. We will work with you to draft this release to include some history of the property, or people who have occupied it previously and any other interesting stories. We are very open about for sale boards and some people like to have one and others don’t. We do find that sometimes even just an arrow board is helpful especially if it is a rural property and hard to find. Our sales team have national experience and a wealth of knowledge of the Shropshire market and are always on hand to help and advise. To join our mailing list and be the first to receive details of new properties matching your criteria please click here. 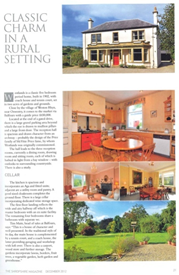 Balfours prides itself as a boutique estate agency offering a truly bespoke service to both seller and buyer. With an experienced team, we offer a bespoke service to our clients, combining traditional values with modern technology. 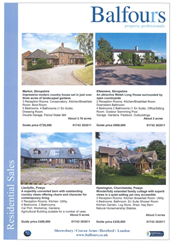 We cover all of Shropshire, Staffordshire, Herefordshire, the Welsh Marches and surrounding counties, specialising in residential, agricultural and development sales. 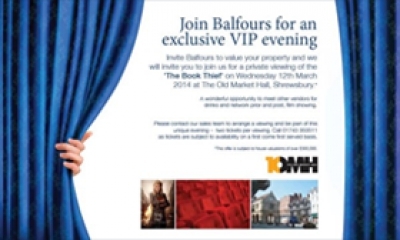 Free Private View Cinema Tickets - for Residential Valuations. Two free Cinema tickets are being offered to a private viewing of The Book Thief at the Old Market Hall theatre on Wednesday 12th March. Any property which we attend for a market appraisal where the property is valued at over £300,000 will be entitled to tickets. We would be happy to visit you at your property to carry out a free, no obligation market appraisal and valuation. An empty property is not only losing rental income but also becomes a liability. As soon as we are instructed on a property our aim is to sign up a reliable tenant who will take care of the property and pay a market rent. We know that our clients often do not want to be involved in the irritations of the residential or commercial lettings market so we also provide a property management service, keeping abreast of regulations so that our clients don't have to. It should be no surprise that Balfours is Shropshire's largest residential lettings agent: We know how to position a property on the market. We have invested in a state of the art web based lettings database that generates 80% of our enquiries. We know what our clients are looking for and we know how to provide it.